If you decided you wanted to go ghost hunting, you’d probably assume you need to visit a crumbling medieval castle, or a grand stately home in the country. Even pubs and hotels seem to accrue a high number of hauntings, compared to other hives of human activity like hospitals or offices. So would you be surprised if I told you that you could have a paranormal experience during the day…in the woods? 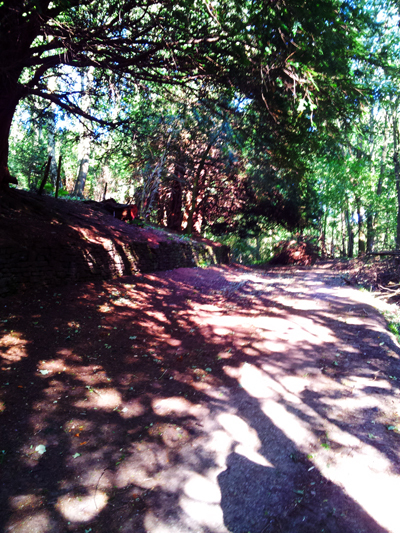 David and I took a trip today to the woods around Beamish Museum and Causey Arch. The area was once riddled with mineworkings (indeed, you can visit a drift mine at Beamish) and the paths through the woods follow the waggonways that would have taken the coal to the Tanfield Railway, ready for transportation to the Tyne. Most parts of the country favoured canals, but the deep valleys of the North East lend themselves better to waggonways – indeed, when these waggonways began to be used elsewhere in Britain, they were known as Tyneside Roads. It was a beautiful day today, if a trifle windy due to the after effects of Hurricane Katia, and we enjoyed the stroll through the woods, ever watchful for phantom highwaymen, ghost trains and spectral hikers. 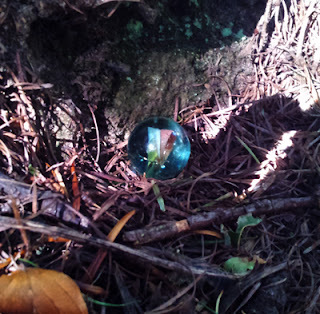 While following the path that runs between the back of Beamish museum and Mill Wood, David spotted a marble in the middle of the path. No, we don’t know what it was doing there, either. David picked it up and we carried on our way. You know that feeling when someone’s watching you? Both of us kept turning around, convinced that someone was following us. The path was deserted for at least half a mile in each direction, and yet we had the distinct impression we were not alone. I even got the fleeting sense that we were followed by something male. We heard twigs snapping on the path behind us, yet when we turned around, there was nothing there, and the snapping stopped, as if whatever was following us had also stopped. We’d gone prepared, and we got the EMF meter out. The meters are actually scientific tools used for measuring electromagnetic fields, particularly the AC fields emitted by man-made sources. They’re good for detecting fields around electrical goods etc. to rule out electromagnetic radiation poisoning and so on but in the field of paranormal research, they allow an investigator to pick up on the electromagnetic fields believed to be caused by spirits. If you’re nowhere near a man-made power source and one of those puppies goes off, then you need to start considering potentially paranormal causes. We’d been taking readings all along the path, and were getting readings of minor electromagnetic radiation. That in itself was surprising given the lack of potential sources, but we started getting spikes in the readings. The needle on the gauge flicked up into the high yellow segments while the meter squealed. On a whim, David got the marble out. 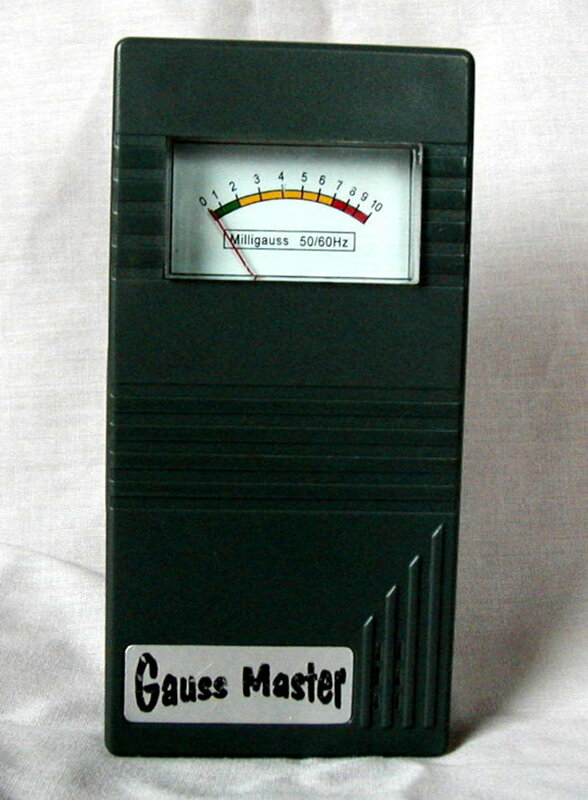 I held the EMF meter beside it and the needle went crazy! We also tested the meter beside my phone and David’s camera but in both cases, the needle dropped back into the ‘normal’ range, ruling them out as potential causes. Back to the marble and up went the needle again. David decided to ask out (basically a verbal way to establish contact) and again, the needle peaked. The sensation of being watched was a lot stronger now we’d stopped. We established a “one peak for yes” and “two peaks for no” system, and we ascertained that the marble belonged to our unseen companion. Whether the marble belonged to it in a material sense, or was simply a physical object to which the entity had taken a shine, we don’t know, but when David asked if he could keep it, the answer was a vehement “no”. He put the marble on the wall at the side of the path out of harm’s way and told the entity he was leaving it somewhere safe. The EMF meter settled right down, and as we followed the path away from the marble and around a bend, the feeling of being followed also stopped! I can’t even begin to explain what it meant, and I know a lot of skeptics and naysayers will scoff at such subjective evidence as “feelings of being watched or followed.” Indeed, as a student of the uncanny, I can easily explain the psychological causes of those feelings. However, with practice it becomes easy to tell the difference between imagination and genuine sensation, and we simply cannot explain the behaviour of the EMF meter. There were no nearby sources of electricity to set the meter off, and I hardly need point out that the marble was made of glass, which is an inert substance that doesn’t emit electromagnetic radiation. No, I feel we had a genuine encounter, though with what, I can’t say. It just goes to show that you can find the paranormal anywhere. I love your ghost investigations. And yes, I am a skeptic, but all the same quite glad you left the marble there. I think it’s good to be skeptical in a way – I like to try and eliminate all obvious or rational explanations first. In some ways I’d like the cause to be mundane, but sometimes there’s just no other way to explain it without resorting to a paranormal cause! I have an internal “radar” for weirdness. During my time in Ireland only once did I have a severe buzz from the environment–in the Cobh railway station that has been converted into a museum detailing the Irish immigrants’ history. Even before I stepped into the actual display area, I had a terrible twitchy feeling, as though a great deal of pain and sorrow had transpired there. It’s amazing how you can pick up on things. You’ll have to let me know what you find out!